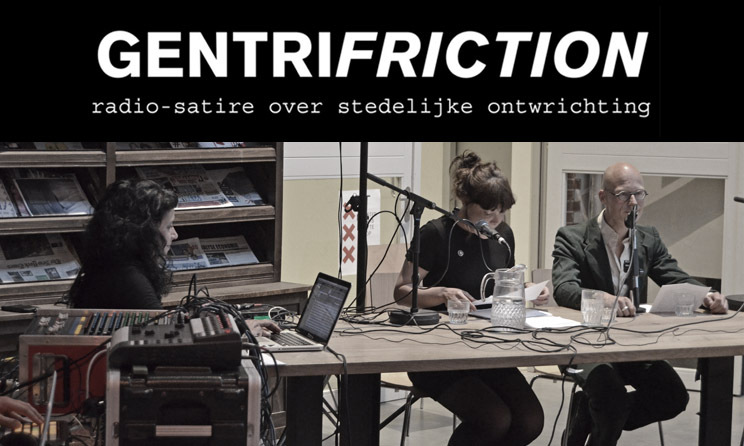 Satirical radio broadcast and public discussion about the gentrification of Oud-West, a neighbourhood in Amsterdam, and how this process affects inhabitants and communities. A sound story about daily life, memories, new trends in automated flex-living on credit, social exclusion, eviction, displacement, and resistance. This one-off broadcast is the result of an intensive exploration of Oud-West’s sound and noise, with a particular attention to the given theme ‘gentrification’. 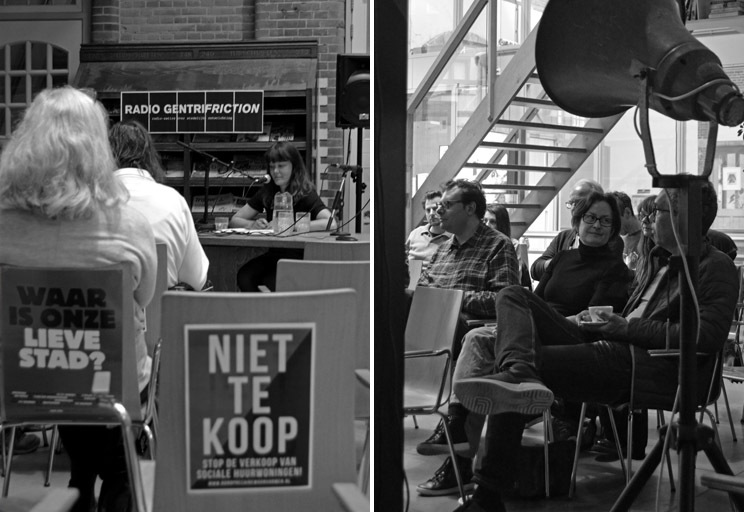 The project is part of Sonic West, collaboration between Soundtrackcity and OBA Amsterdam (Amsterdam Public Library). Broadcasting script by Donia, Taufan, Sanne and Rutger. 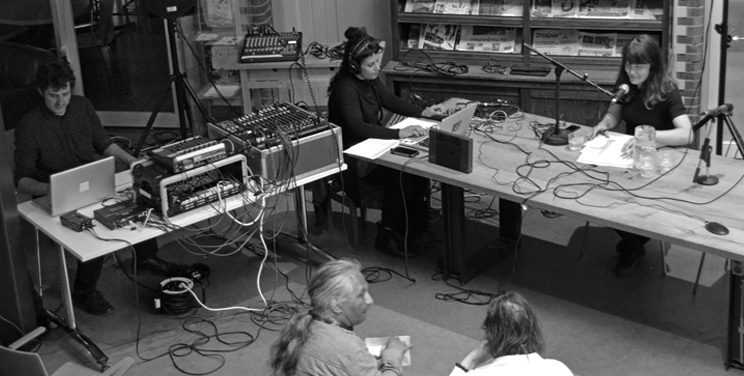 Sound material: field recordings from Oud-West in Amsterdam, Fair City demonstration 2017, Bond Precaire Woonvormen (Precarious Housing Union), Huurdersvereniging Oud-West (Tenants Association Oud-West), Amsterdam Alternative (statement from free newspaper), interviews with Erik van den Berg, Rens and aforementioned guests, AT5 news report (Kinkerstraat, 2009), Van Kooten & De Bie and archive material from Staatsarchief and various free radio stations. Regarding ‘Dubbel Makelaars’, see Hertog Nadler, Double Take (2018). Special thanks to: Renate Zentschnig (Soundtrackcity), Erica Schoen (OBA), Ivo Theunissen (images, video, audio and other input), JT, Pixie, Nootski and Dread_Rat (DFM Radio & Television), Jop (Vrankrijk), Eric Duivenvoorden (Staatsarchief), Abel Heijkamp (Bond Precaire Woonvormen & Alles Flex? ), Rens, Hans van den Ban, Woonwerkpand Tetterode, West Wednesdays, Henk van Dijk, Erik van den Berg, Nolda Rijkenberg, Katie Kerl, Theo Schepens, Thea van Eijk, Pierre de Ries, Bert Meister, Aridan Mecava, Carla, and indirectly Het Schip and the Institute of Sonology. Sonic West is supported by Mondriaan Stichting, Amsterdams Fonds voor de Kunst, Stimuleringsfonds Creative Industrie, Gemeente Amsterdam West.